The Happy Homebodies: Happy 2015! I love the beginning of a new year! It's time for fresh beginnings. 'Tis the season to take down the holiday decorations, clean out your closet, donate your extra junk to the local thrift store, replace the sugary goodness in your fridge with spinach and just generally press "reset" on your daily routine. I'll be honest – 2014 wasn't my favorite year of all time. Luckily, that makes it easy to bid adieu! I'm ready to welcome a new year ripe with possibility. The first thing I usually do to start the new year is pick my "word of the year." It's supposed to be a word that encapsulates what you want to focus on in the coming year. In 2012, my word was thankful. In 2013, I chose focus. I never wrote a blog post about it for 2014, but my word was "grateful." That's basically been my special word ever since we got married, and I write it in the condensation of my glass shower door (and even inspired a DIY floor mat) every single day. It's a weird habit that I started a long time ago, but it helps me remember to be grateful for our blessings even when I'm grumpy (which is more often than I'd like to admit). Oops. After a little introspection, it was pretty easy to think of my word for 2015: hope. These past couple of years have taught me something about myself: When I'm praying or longing for something that I consider unlikely to happen, I assume it won't happen just to contain my disappointment. It's a coping mechanism. I've always been a "prepare for the worst, hope for the best" type of personality. It helps me keep my emotions in check. It's hard to put yourself out there when you know it might lead to crushing disappointment, whether it's in a relationship, career, marriage, finances, etc. I'm SO not a risk-taker. And allowing yourself to hope – really, really hope for something – is a risk. But here's where faith comes in. 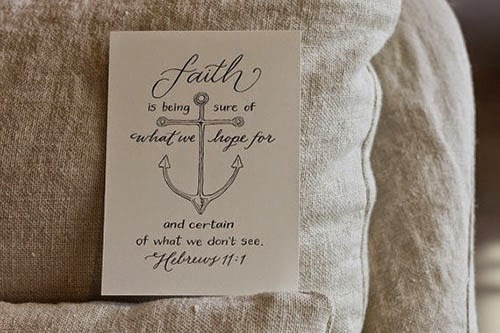 Hebrews 11:1 reads, "Now faith is confidence in what we hope for and assurance about what we do not see." I want this so badly... but that doesn't mean it will happen. In fact, it probably won't happen. But then again, maybe it will. I know God is listening. He can overcome any worldly obstacle. Of course He can. But that doesn't mean He always answers our prayers in the way we planned. We can be as hopeful as possible, but His path for our lives might be different than ours. He never promises we'll get everything we want. And round and round I go. Some days I'm happy and hopeful; other days I'm sad and defeated. As someone who has always prided herself on mental stability, I roll my eyes at my own behavior. I apologize to my sweet, loving husband who doesn't know how to fix it – and we all know he is Mr. Fix It. Long story short, this year is about hope. More specifically, it's about allowing myself to have the purest of hopes, putting my doubts and fears in a box, high up on the shelf where I can't reach them. It's about a willingness to put myself out there and know that if I fall, if the disappointment that I've tried so hard to avoid actually comes closing in, God will see me through it. Because that expression that we've heard before is so true: If God brings you to it, He'll bring you through it. Hope is a beautiful thing, don't you think? Enough about me! What's your word of the year for 2015?